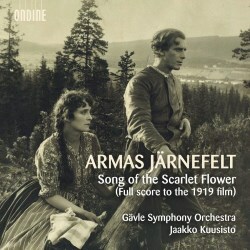 Song of the Scarlet Flower was Sweden’s biggest grossing silent film. First screened in 1919 it was also the first Nordic film with a tailor-made, full-length score and in its first screenings the orchestra was conducted by the composer of that score, Armas Järnefelt, now fifty years old and at the height of his public fame. Finnish-born, he was the conductor at Stockholm’s Royal Opera and his best composition years were behind him – his best-known works date from the two-decade period around 1890-1910. But as a distinguished and vastly experienced operatic conductor he was well placed to take on a film score and as a Finn he was perhaps thought temperamentally suited to the source material, which was a Finnish novel. He suffered the fate of film composers of most stripes, building up his score bit by bit, being obliged to cut it, refashion it and forced to conform to the film’s tempo rather than setting his own. But he laced the score with motifs and ensured that the mood of the various scenes was enhanced by supportive music, familiar enough strategies, of course, but by no means quite so simple in 1919. His approach to ‘source music’ – that is, music that the characters in the film actually ‘hear’, usually folk dances - is now a familiar stratagem for film composers. Järnefelt wrote for a theatre orchestra, not full symphony orchestra, ensuring plenty of folk fiddle music, dances, hymnal moments and lashings of generally Late-Romantic moods, predominantly of the frei aber einsam kind: lonesome scenes. The complex web of circumstances that have enabled the score to be heard in full here are detailed in the booklet essay. The score was rediscovered in the 1980s but frustratingly it’s not possible to synchronize it with the film, as the score is longer than what survives of the film; elimination of repeats and editing is necessary to match them together. Fortunately for a recording, authentic orchestration prevails, rather than an inauthentic re-orchestration that has done the rounds in recent showings of the film. Given the long ‘chapters’, which follow the book, which span everything from nine to 17-minutes, I would advise listening to each chapter as a kind of mini tone poem and rely on the booklet synopsis to guide your listening. That, at least, is what I did. That way you will enjoy the winsome folkloric winds, the jovial festive elements and delightful dances borne up on rich orchestration. There is the solo violin’s romantic-melancholic solo over tremolandi in the second chapter, the song of the oboe, strong, lean themes and stormy writing – a melancholy chorale – with added piano. With his gift for strong thematic writing as well as limpid floral bouquets of sound, Järnefelt’s music makes a consistently pleasing impression. Brassy, skirling moments are present too – there’s also a ‘shooting the rapids’ scene of real excitement – as well as languorous romance, coquettish waltzes, but darker death-laden paragraphs. Everything you’d want, in other words, from a Nordic score of the time, or any time. It’s beautifully performed here, the score having been restored by Jani Kyllönen and conductor Jaako Kuusisto and first performed in March 2017 at the Oulu Music Festival. Maybe it’s a candidate for transfer to Blu-ray/DVD? Certainly, this extensive 100-minute score powerfully whets the appetite for a showing.